It’s a good idea in theory. But the underlying assumptions raise some big questions, outlined below. Maybe people will work out smart solutions. Or the ideas and energy might evolve in different directions. I’ve mentioned a few possibilities at the end. It’s got to be true that more people affected by crisis have access to smartphones than ever before. But very many still don’t. The most vulnerable and marginalised people have the least access & literacy (specially women and girls), and are most likely to miss out on aid. 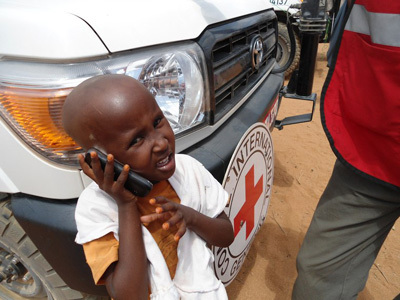 Mobile phones are one communications channel for aid agencies, but they won’t reliably be the major one for a long time yet. On TripAdvisor, all customers assess the same basic services from all suppliers. The services that humanitarian agencies provide vary hugely: from providing food to health services to refugee camps; from working with whole communities to specific groups. And they work in completely different operating contexts. It’s not possible to compare direct feedback from residents of a refugee camp in Jordan to feedback from people in a city hit by a typhoon in the Philippines. Recent research has confirmed that it’s not appropriate to expect the people who receive (or should receive) aid to behave like demanding customers or muscular citizens. The ‘aid transaction’ is different. Recipients tend to feel grateful. Often some of the least powerful people in society, they can be naturally cautious about criticising power. They have no hard mechanism for accountability, equivalent to withdrawing their custom or vote. Agencies need to invest in building up dialogue and trust if they want to hear their real views. Currently, recipients don’t have much choice about which humanitarian agency they receive services from. Should they have more? That would require substantial duplication of supply, which it’s unlikely that donors would or should fund. The lack of choice probably undermines people’s incentives to give or use feedback. Feedback on an individual agency or general needs? Should people be asked for their feedback about an individual agency, or about their general needs? TripAdvisor relies on the former, to enable comparison and drive improvement by suppliers. But literally hundreds of agencies work in a major humanitarian response. People don’t always distinguish between them. They may be more concerned about letting authorities know about their general needs. This creates a different dynamic and use for feedback, closer to holding governments accountable. Who would fund the service? A humanitarian rating service would most likely be funded by the same donors that fund operational agencies, or by the agencies themselves. So it would not be independent – and may not be seen as impartial. It may be tough to market the service independently of agencies: in a crisis they are often the organisations with the reach into vulnerable and affected populations. As you can see, I think this is a nice concept, but I’m not sure it’s workable. I loved Tom Steinberg’s quote on Duncan Green’s blog on the subject: “start by choosing just one kind of review of one very carefully chosen kind of service … get that working and move on from there”. How about these initial ideas for developing the idea further? Many aid agencies want to listen better to the people they serve. There’s a great opportunity to sell them concrete tools and services they can use to improve their work. And to work with governments and donors to make these approaches mandatory. E.g. Groundtruth’s work. If different agencies collect feedback using the same tools / standards, then they may be able to compare some aspects of performance. The Core Humanitarian Standard is a great basis to work from. This could help address the crippling contract culture. In any specific context, it may be possible to work with local media and NGOs to hold government and other authorities accountable for the use of funds and provision of services. This would be boosted by a radical increase in transparency. Build on other feedback mechanisms, like Keystone’s Partnership Survey or DARA’s Humanitarian Response Index or employee satisfaction surveys. See the dozens of great points and initiatives in the comments on Duncan Green’s blog. There is the question also of genuine feedback – the moderation and detection of fake reviews….and how to encourage the publication of serious concerns – few were brave enough to publicise for example their private concerns about Kids Company….employees, beneficiaries and indeed donors all stood to lose enormously.